These two rock-solid financial stocks are on sale -- which is the better bargain? Berkshire Hathaway (NYSE:BRK-A) (NYSE:BRK-B) has produced incredible returns for Warren Buffett and the company's other investors for half a century, but Buffett himself has warned that the outstanding performance will not continue at the same level. Similarly, Wells Fargo (NYSE:WFC) has done incredibly well over recent decades, but it's now the largest U.S. bank by market cap. Despite both companies' somewhat limited growth potential going forward due to their sizes, there are still plenty of reasons to like each one. Wells Fargo is a longtime Buffett favorite and is actually a close second for Berkshire's largest common stock holding. After a closer look, it's easier to see why. First, Wells Fargo has a strong history of prudent risk management and efficient operations, which has allowed it to consistently return better profitability than the rest of the "big four" banks. 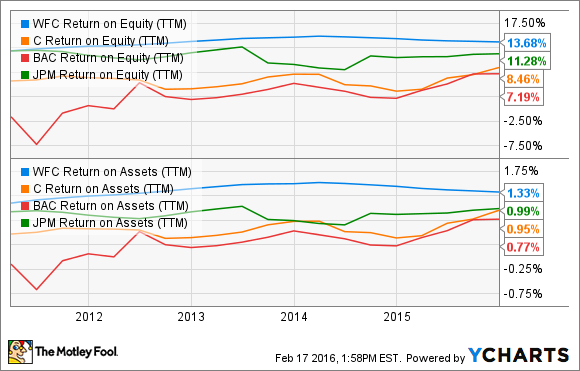 Just take a look at Wells' return on assets and return on equity relative to its peers. The bank's 2015 numbers give no indication this trend will stop. The bank's year-over-year loan growth of 7% and deposit growth of 6% were among the best in the industry, and some of the individual areas of growth were even more impressive. For example, commercial real estate loans grew by 10% from last year, and the bank's overall loan portfolio is now a 50/50 mix of commercial and consumer loans. The bank also produced record auto loan originations in 2015 and issued 2.7 million new credit card accounts -- an 18% increase from 2014. In fact, Wells Fargo produced the best revenue growth of the six largest U.S. banks last year -- which is even more impressive when you consider the persistent low interest environment. As far as valuation is concerned, the entire banking sector is on sale right now -- partially because of fears related to oil and gas loans on the books. Wells Fargo is no exception, with $17.2 billion in outstanding loans. However, Wells Fargo has already set aside $1.2 billion in reserves specifically for this purpose, and I think the default fears are overblown for the bank. Besides, Wells Fargo is trading for a price-to-book level not seen since 2013, so any negative effects should be more than factored into the stock price already. I love Berkshire Hathaway as a core portfolio holding for several reasons. Obviously, you have Warren Buffett himself and his fantastic team managing your investments. And, Berkshire has a strong history of beating the market during bad times, which, as I've written before, is the most important component of solid long-term performance. You also get Berkshire's 60+ wholly owned subsidiary companies, including GEICO, NetJets, Pampered Chef, Fruit of the Loom, and many others. The point is, Berkshire's revenue comes from not one, but nearly 100 different rock-solid businesses. As far as valuation goes, Berkshire is also on sale now, trading at its lowest valuation in two years. Warren Buffett has said that Berkshire would begin to aggressively buy back shares at a valuation of 1.2 times book value, which implies he would consider that level significantly undervalued. At 1.28 times book as of this writing (down from 1.5 a year ago), it's getting close. Out of the two, I would buy Berkshire Hathaway right now. Not only is the diverse collection of businesses and stocks impressive, but shares are trading close to a level that Buffett himself says is significantly below intrinsic value. Besides, it's not like you really have to make a decision between the two stocks -- Berkshire owns more than 9% of Wells Fargo, so you'll reap the benefits of the big bank's growth regardless.